The St Mary's boxing club was out in force at Dublin Airport yesterday to welcome home newly crowned champion Kellie Harrington and the Irish squad from the 10th AIBA World Women's Elites in New Delhi, India. Harrington, who boxes out of the Dublin club, topped the lightweight podium on Saturday after beating Thailand's Sudaporn Seesondee on a 3-2 split decision at the Indira Gandhi Stadium. "To stand on top of that podium and have our flag raised above my head yesterday was just so emotional for me, the best feeling ever," said the Dubliner, who claimed silver at light-welter at the 2016 World Elites. Noel Burke, Harrington's trainer at St Mary's and an AIBA 2-Star coach who has also worked Ireland's corner internationally, said it was a proud moment for the Tallaght unit. "Kellie boxed incredibly well and to be welcoming home a World champion is absolutely fantastic. I've been involved in boxing for a long time, but Kellie sticks out. She has incredible drive, she's an incredible athlete." Ireland, with Zaur Antia and Dmitry Dimitruk in the corner and Bernard Dunne as Irish team manager in India, finished sixth in the medals table at the 72-nation tournament. China, Chinese Taipei, India, North Korea, Germany and Ireland, in that order, commanded the top six positions, with Asia, which won eight of the 10 gold medals, throwing down the gauntlet to Europe going into the 2019 Olympic qualifiers. The USA, under former Irish head coach Billy Walsh, claimed three bronze and finished 14th, while ex-Irish coach Eddie Bolger won the Best Coach Award with Germany. Saturday's victory was Harrington's fifth in eight days and arrived almost 12 years to the day since Katie Taylor won the same lightweight title for the first time on November 23, 2006, in New Delhi. Taylor, who has since turned pro, tweeted that Harrington's performance was unbelievable. Harrington, Taylor and Michael Conlan are the only Irish boxers to claim AIBA World gold. Conlan believes that Harrington, the only Irish boxer to win two world medals at different weights, is a major talent. 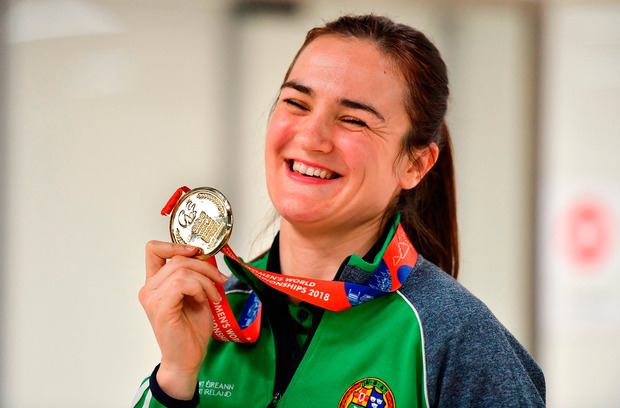 "How fantastic is it that we have a lightweight World champion in the amateurs and a lightweight World champion (Katie Taylor) in the pros," said the Belfast feather, whose Dublin-born dad, John Conlan, is an IABA High-Performance coach. "I spoke to Kellie and we're all unbelievably proud of her. Women's boxing is probably stronger than it ever was. There's no better time to win the Worlds. For me, when I won in 2015, I was already qualified (for Rio 2016). "She should enjoy this incredible win, for now, because you know, there's no point in looking too far ahead," said unbeaten Conlan, who meets Jason Cunningham in his 10th pro fight in Manchester on December 22. Meanwhile, February's Irish Elites will be the next port of call, with the focus then switching to two Russia-hosted World Men's and Women's Championships in Sochi and Siberia next September and October. Both tournaments will be Olympic qualifiers amid international disquiet that Russia has home advantage for two major Tokyo 2020 qualifiers. Harrington hailed her coaches in New Delhi and Ireland and admitted that fighting five times in eight days was demanding. "It has always been my dream to become a World champion. My focus has been brilliant - tactics, analysis, strength and conditioning, coaching, staying on track, never letting it drift off," she added. Ireland have now won the AIBA World Women's lightweight title six times. Canada, with two wins, France and Russia are the only other nations to hold the belt.